The Advanced Life Support in Obstetrics (ALSO®) provider course has made a positive impact on maternal outcomes in four low-resource countries, according to a paper by the UW Department of Family Medicine and Community Health’s (DFMCH) Lee Dresang, MD, John Beasley, MD, Jim Damos, MD, Ann Evensen, MD, and other collaborators. 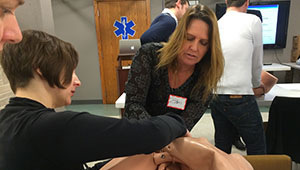 Ildi Martonffy, MD, oversees an ALSO® course participant practicing a normal delivery. The paper, published in the International Journal of Gynecology and Obstetrics, analyzed patient outcome data from Colombia, Guatemala, Honduras and Tanzania—-four countries where the course is actively taught. The ALSO provider course is a two-day learning experience that teaches maternity caregivers evidence-based management of obstetric emergencies, with the goals of improving patient care and increasing clinicians’ comfort in managing obstetric emergencies. In Tanzania, the frequency of PPH decreased while management of it improved. The study authors concluded that although ALSO training is not likely to improve maternal mortality in high-resource communities where maternal mortality is already low, it can save lives when introduced to low-resources areas where maternal mortality rates are high. The ALSO provider course was developed in 1991 by Drs. Beasley and Damos and is now owned and run by the American Academy of Family Physicians (AAFP). It has been taught in over 63 countries and completed by over 160,000 maternity caregivers.